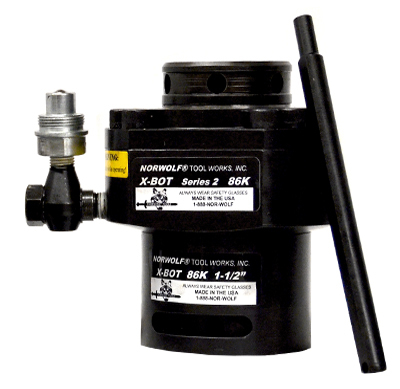 New Norwolf XBot™ hydraulic bolt tensioners are used extensively in offshore.oil, refining, gas transmission, and power generation industries. • Operates at only 10,000 psi hydrualic pressure. • Conversion kits available for different bolt sizes. • Fits all API flanges. • Alloy steel cylinder “milled” to fit in restricted areas. • 3/8” to 3/4″ stroke. • Built in safety cap. • Can be “daisy chained” to operate on multiple bolts simultaneously.